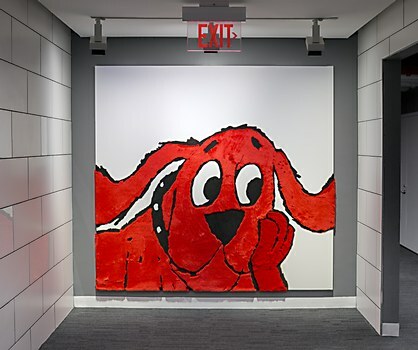 Scholastic’s most iconic characters are reimagined for the publisher’s corporate headquarters. 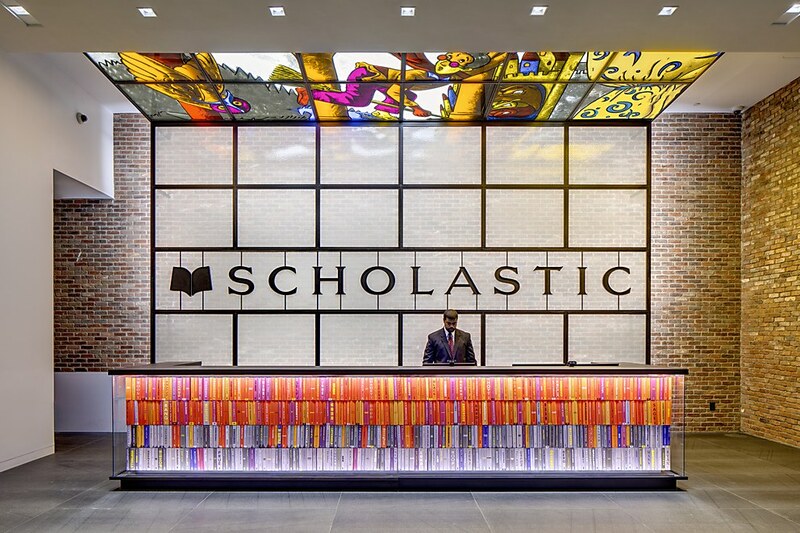 Background: Scholastic is the world’s largest educational publisher and distributor of children’s books, home to favorite series like Harry Potter, Clifford the Big Red Dog and Captain Underpants. 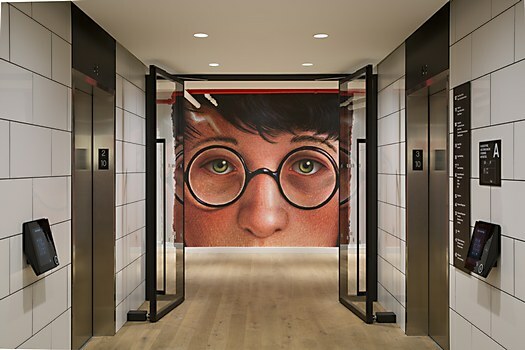 Pentagram created environmental graphics for the publisher’s corporate headquarters in New York that reimagine the iconic characters in a series of large-scale artworks and installations. The unique approach was inspired by the offices’ location in historically art-rich SoHo and brings the interiors to life in a dynamic and magical way. Reasoning: The graphics enhances the interior spaces with Scholastic books, characters and history. 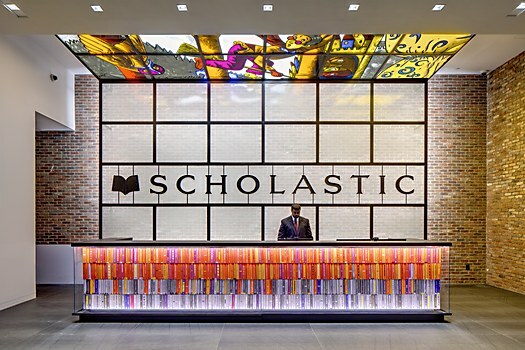 The audience is Scholastic employees, so the offices needed to feel like an adult workplace and not a children’s environment. 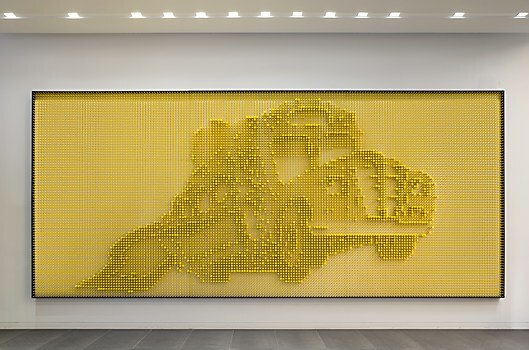 The installations integrate the characters into the architecture in a variety of materials and media, utilizing artwork and text from books and publications in an artistic way so that the space feels vibrant, witty and joyful. We picked the inspirations like a publisher, and the locations like a curator. Challenges: Delay in the overall construction caused some delay in our work being completed within the estimated time frame. Favorite details: The lobby is like an art gallery and turned out just how we imagined it to be. 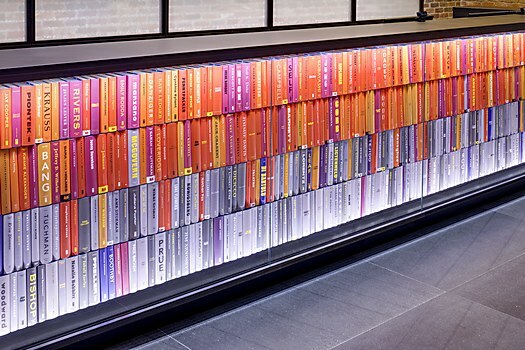 The new front desk is an illuminated eighteen-foot-long “magic bookshelf” built out of 800 books that appear to float in the air. The covers of the books were redesigned to feature the names of authors published by Scholastic. 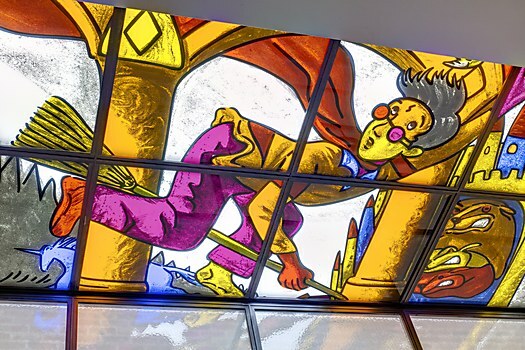 J. K. Rowling’s Harry Potter floats in a colorful grid in the painted-glass style of UK artists Gilbert & George. 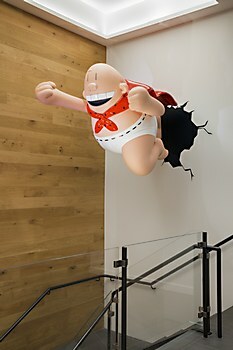 A giant, three-dimensional Captain Underpants smashes through a wall, and Clifford the Big Red Dog appears in seven-foot-tall murals in the elevator banks on each floor, made of stretched canvas sewn with fur, so people can pet the walls. 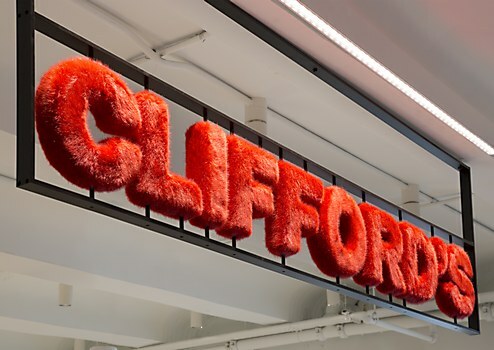 The employee cafeteria on the building’s top floor has been renamed Clifford’s—complete with a sign in big, furry type. 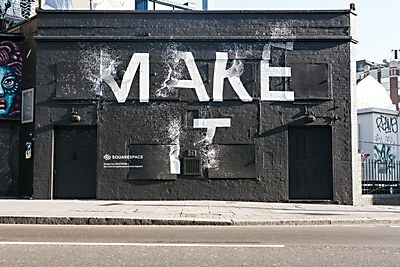 Visual influences: Artists Gilbert & George, Sol LeWitt and Roy Lichtenstein. Specific demands: Sourcing the various products, materials and fabrication resources were somewhat challenging. We were simultaneously creating a series of individual artworks and installations, all different and with their own challenges. The physicality of Mohawk Maker Quarterly’s newest issue entices designers to start crafting their own projects in real life. 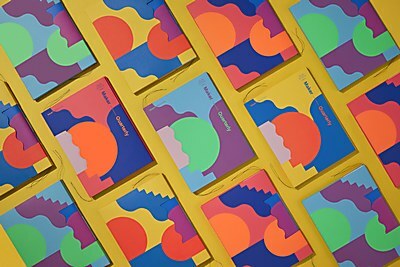 Designer Craig Ward’s hand-painted mural designs for Squarespace brings sharp-edged pixels to life. “A Guardian” raises awareness for the problem of poaching and the technology that can be used to fight it.